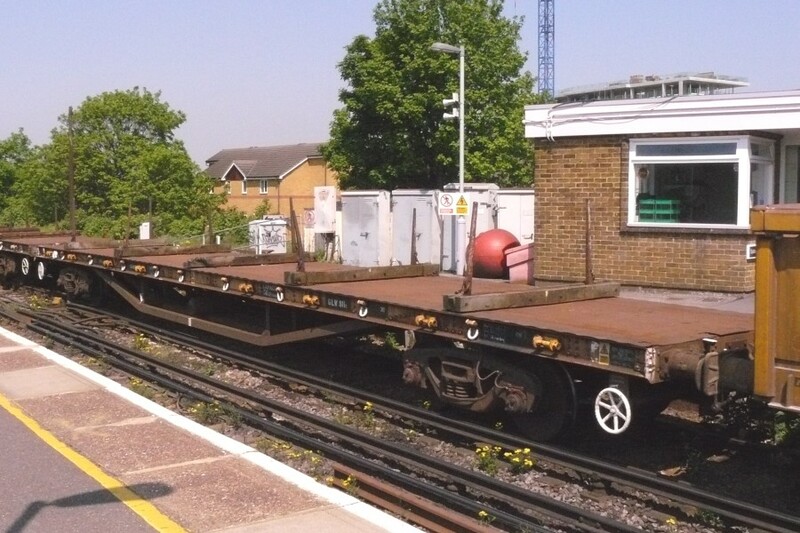 Summary: The Salmon was a bogie rail wagon built in large numbers during BR's early years. Surprisingly, almost 400 remained in stock in 2008, all having been upgraded with air brakes and new bogies. 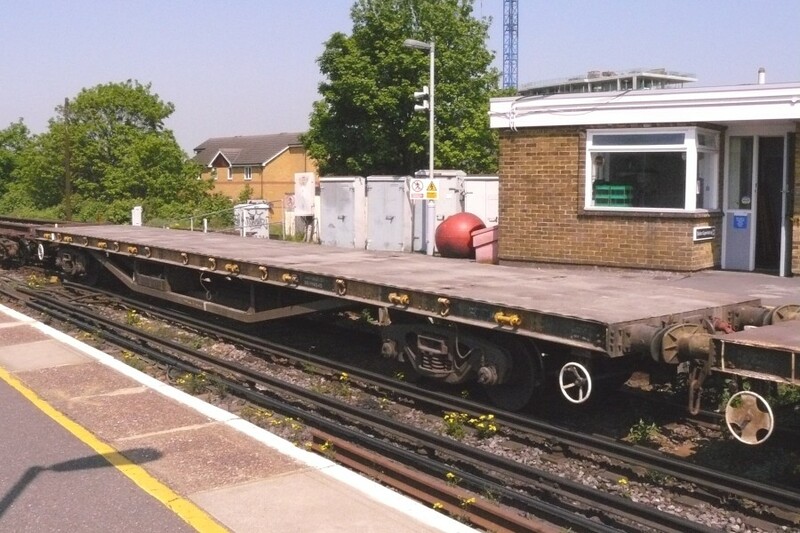 The type is now mainly used for carrying track panels. History: The 'Salmon' bogie rail wagon was based on an LMS design and was a 62ft long flat wagon fitted with 5 bolsters. A single wagon could carry a number of 60ft lengths of rail, while a rake of wagons could handle 600ft long welded rails. A total of 894 wagons was built between 1949 and 1961 under 15 separate lots. Builders included private firms such as Head Wrightson Ltd and G R Turner as well as BR workshops at Derby and Wolverton and the 6 different diagram numbers issued reflected minor differences such as the inclusion or omission of a curb-rail. The wagons were built either unfitted or with a vacuum through pipe and in 1974 these were coded YMO and YMP respectively, with design codes in the YM500x, YM501x and YM502x series. By this time, many of the Salmon had had their bolsters removed to enable the carriage of 60ft track panels. Others were fitted with twin cranes to handle rails and these received TOPS codes in the YFx series. 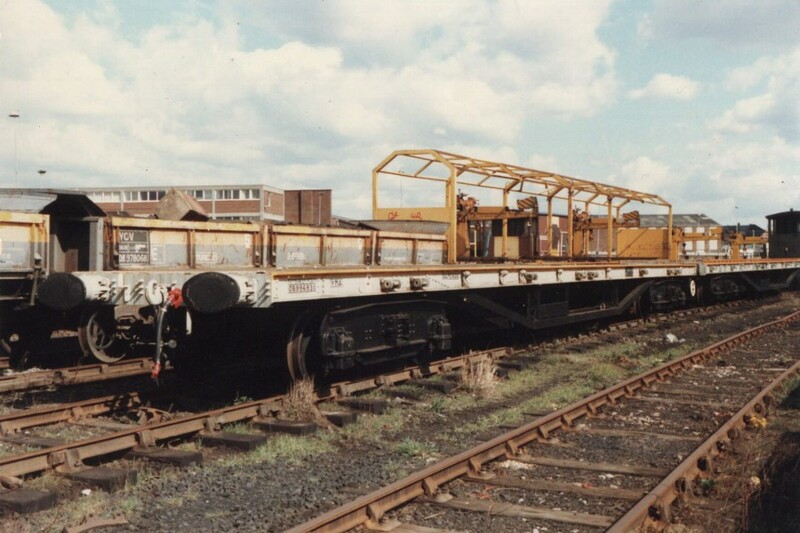 The first of two modernisation programmes took place in the 1980s when air brakes were fitted to a large number of wagons, mainly at Doncaster works. These became YMAs, while a few retained (or gained) vacuum pipes and became YMBs. Overhauled wagons were also treated to a repaint in either yellow or grey with a yellow top. Other modifications at about the same time were the fitting of steps (generally at the left of each side) and strap tensioners (mounted on the solebars). The majority of Salmon wagons were mounted on BR Plateback bogies of either 5ft 6in or 8ft wheelbase. These had oil bearings that required frequent maintenance and even then resulted in many 'hot box' incidents. The wagons were limited to running at 50mph and it is believed that this was later reduced to 40mph. In early 1998 two Salmon were fitted with new ASF bogies in an attempt to combat this issue. Both retained their YMA coding but with a new design code of YM501W. Following trials, the conversion of 125 wagons was authorised and these started appearing later in the year. A new TOPS code of YSA was applied with design codes in the YS043A to YS043D range depending on pre-existing detail differences. The permitted speed was 50mph but there were also improvements in reliability. In 1999 TOPS code YWA was also issued for re-bogied Salmon, these being ones permitted to run at 60mph. 19 had been converted by the beginning of 2000, rising to 166 by mid-2001 and 193 in 2008. A range of design codes in the YW001 and YW002 series were issued. The last un-rebogied YMA and YMB wagons were withdrawn in 2006 although a number remain in store. The table below compares the number of Salmon wagons in stock in May 1999 and January 2008. The next table shows a breakdown of the design codes for the 388 wagons still in stock at January 2008. The number of different codes illustrates the variety within the fleet in terms of the differences (and combinations) of bogies, floor types, bolsters and amounts of strap tensioners. Although supplemented by a fleet of FDA track panel carriers converted from Freightliner flats, the future of the Salmon fleet appears relatively secure and they can still be seen on most regions. They are however rather difficult to individually identify, the painted stock numbers often being obscured by the steps and/or strap tensioners. Despite the youngest examples being 47 years old at the time, a further program of modifcations was started in mid-2009. The work, undertaken by Marcroft at Stoke and Crewe, involved the fitting of three large stanchions to simplify the loading of track panels. One at each end of the wagon holds the panels in place longitudinally, while one near the centre sets the transverse position. The stanchions are painted yellow but only minimal repainting of the wagons was involved. The TOPS code of YKA was resurrected for these conversions, with a new non-fishy 'fishkind' of Osprey applied! Design codes were in the YK001 range and 199 were converted, leaving about 100 as YSA or YWA. A prototype for a design to replace the Salmon appeared in 1983 and was given the same fishkind code. 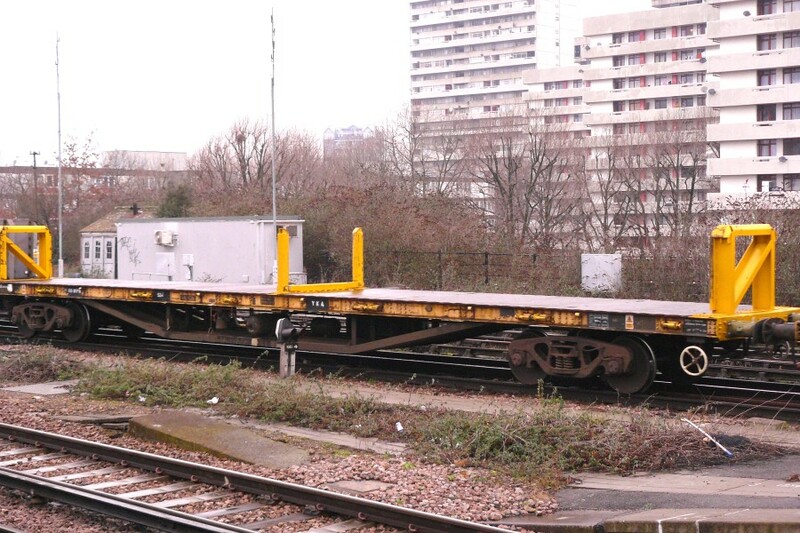 Numbered DB996699, the wagon was similar to the contemporary YEA LWRT wagons with a deep central section to the solebars. It was fitted with air brakes from new and allocated TOPS code YMA-B (design code YM001A), but was destined to remain unique. At some point in the late 1990s it was recoded as a YLA-B (YL004A, fishkind Mullet), then in 2003 it was renumbered 600500 and recoded FZA-A (FZ007A) for use as a switch and crossing carrier. 26/07/2009: Notes on Osprey conversions added. 16/03/2010: Photo of Osprey conversion added. YMA Salmon DB996931 at Willesden in March 1987. This picture shows four types of Salmon. To the right is a YMA with curb rails, while on the track behind are two YFAs with rail cranes, one with canopy and one without. Rebogied YWA DB996530 with traditional bolsters. Lewisham, 7th May 2008. Rebogied YSA DB996242 with a flat floor. Lewisham, 7th May 2008. YKA Osprey DB996283 at Clapham Junction, 18th February 2010. Page added: 29/03/2008 Spotted an error? Got some additional info?